34176 1 month ago Carol Ann Brady,R.N. Valley Forge, PA , US As a nurse, I demand that you act to protect the American public by using the money for our water, environment, and public lands. 34172 1 month ago Anonymous Sydney, ot , AU United (stolen) States, this nation is on the top of the World list of Terrorist and Warmongers! Like all empires from the past, it will rot from the inside out! 34169 1 month ago Barbara Lamb Yorkville, CA , US We certainly have become a war mongering nation, haven't we? Is that what America is all about? 34162 1 month ago Suzy T Kane Wilmington, NC , US As William Sloane Coffin said, we're all in the same boat; if you shoot a hole in the other side of the boat, we all sink. 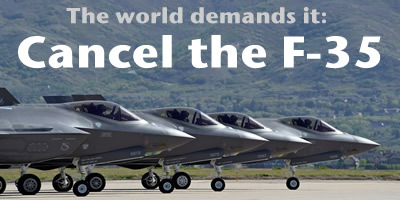 34152 2 months ago Angela Hopkins San Antonio, TX , US Cancel the building of the F-35 aircraft along with all the detriments that go with it. Spend this money on the care of all our people , especially the health and happiness of all our children.